Vandals spray-painted and knocked over a Black Lives Matter banner in Arlington. Lori Kenschaft may never know who used spray paint to vandalize the “Black Lives Matter” banner outside of the First Parish Unitarian Universalist church in Arlington. But she’s not letting the troubling incident discourage the community from installing a new one. Kenschaft and the parish have invited the public to attend a rededication of an identical banner Tuesday evening on the church’s lawn at the corner of Massachusetts Avenue and Pleasant Street. The parish’s minister, Marta Morris Flanagan, will speak, then lead attendees in song. “We are not talking about a big protest, or a big event, but we want to have an opportunity for people to come together, and feel together, that we are collectively restoring the banner,” said Kenschaft, who is the parish clerk. The display outside the church was inspired by the national “Black Lives Matter” movement, which formed in response to the deaths of unarmed black people during encounters with police. Churches around Greater Boston, including in Somerville and Bedford, have put up similar signs. The Arlington parish first erected a 3-foot-by-9-foot banner at the busy Arlington Center intersection in January. The banner stayed up through March, despite the record-setting snowfall last winter. Once the snow melted in the spring, Kenschaft noticed the sign was damaged by the harsh weather, so the church purchased a new one. That banner, which was supported by a sturdy metal frame, was placed at the intersection in June. The sign came down briefly that month to make way for a “Celebrate Equality” banner, which was created when the US Supreme Court released its marriage equality decision. Other signs have appeared at the site since the summer, but the parish decided on Oct. 9 that it was time to put the “Black Lives Matter” banner back outside. 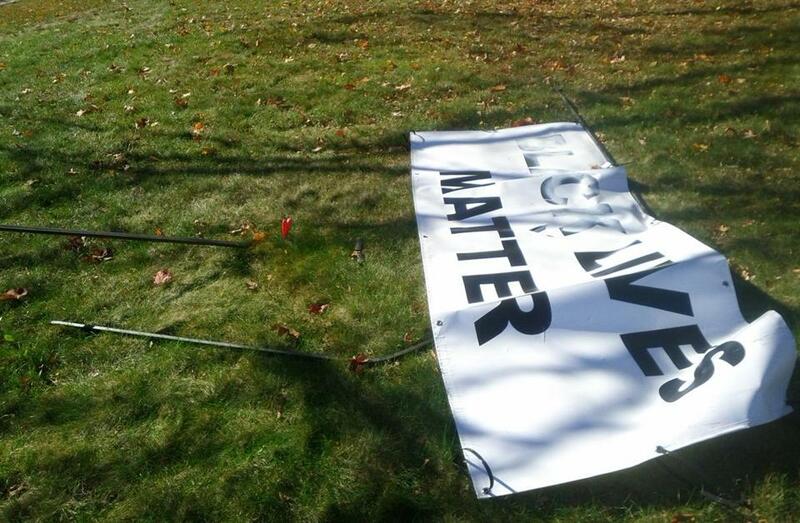 A week later, Kenschaft said, vandals spray-painted over the word “black” — so the sign read “Lives Matter” — and then ripped the frame of the display from the ground. Kenschaft said a member of the congregation called her on the morning of Oct. 18 to notify her about the mangled sign. Arlington Police Chief Fred Ryan said officers are investigating the incident and reviewing surveillance footage from nearby bank cameras. “Free speech is an important constitutional right, and we will go to extreme measures to protect people’s rights to free speech,” said Ryan, who has been in constant contact with the church. The banner to be set in place Tuesday has an even sturdier metal frame. “It’ll be harder to knock down,” Kenschaft said. And if it is vandalized, the parish will put up another, she said.